A scrumptious holiday tradition. 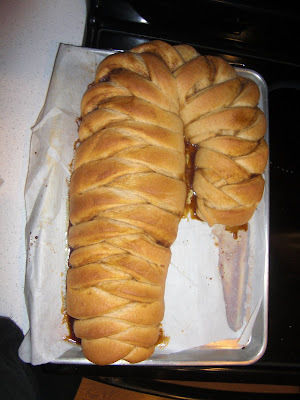 Candy Cane bread. This is made using my Basic Whole Grain Bread Recipe. 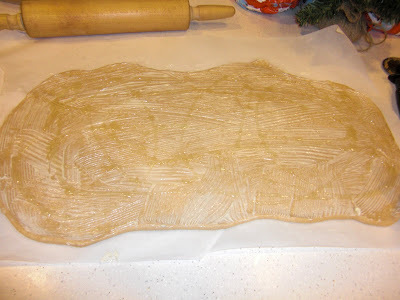 Roll out dough into a long rectangle. Lather with butter, and sweeten with a dab of barley malt syrup and a sprinkling of sucanat and cinnamon. 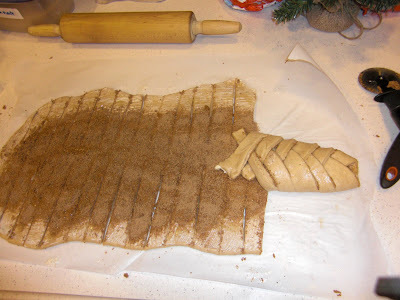 Use a pizza cutter or kitchen scissors to make 2-3 inch slits on each side. Braid. Make the night before and refrigerate. Take out a couple hours before you want to eat to let rise. Bake at 350 degrees for 20-30 minutes. Frost with Creamy White Whipped Frosting. Combine all ingredients in a metal bowl and mix well with a hand mixer. Keep refrigerated and frost when ready to serve.